Services: 24 hours room-service, laundry, Doctor on call, Money Changer, Banking, Safe Deposit, Baby Sitting . The Amar Vilas Hotel Agra, is an Oberoi hotel and offers its guests the excellent standards of service and luxury that the Oberoi Group is known for. Designed by the leading Indian architect Prabhat Patki, the Oberoi Amarvilas hotel is a luxurious getaway fit for a Mughal Emperor. Amarvilas which means "Eternal Haven" in Sanskrit, is surrounded by lawns and waterways inspired by the plan of Mughal monuments. The mesmerizing Taj Mahal is only 600 meters away and each of the 105 bedrooms and 7 suites at the Oberoi Amarvilas offer stunning views of the Taj Mahal, along with ultimate luxury in their design and amenities. What do you think about Oberoi Amarvillas Agra? This is a fantastic hotel. The service, views, staff and food are unparalleled in Agra. I travel quite a bit, for both work and leisure, and the Oberoi Amarvilas is one of the best hotel experiences I have had. Make sure to try Esphahan, the signature lamb dish was the best meal I had in India. The Oberoi staff was absolutely first-rate but at the same time not at all stuffy or overly formal. If you’re having doubts about whether to splurge on the Amarvilas, I assure you that it will be well worth it to stay here. We decided to stop by Amarvilas for some cocktails and dinner to celebrate seeing the Taj. Our guide book had raved about the hotel and although it was very nice, to be honest it wasn't that unbelievable. Personally I didn't think the views were all that spectacular from the bar area, and there were no views from the pool or restaurant. Also the bar was small with limited options. The food was also pretty average, I wouldn't put it in my top 10 best meals in India. One of my travel companions doesn't drink and thus ordered a mocktail called Purple Tide. It was honestly the most disgusting thing I have ever smelled/tasted. Drinking it was like paying 300 rupees to experience college fraternity pledging. I was disappointed that an Oberoi hotel could have such a foul concoction on their menu. I'm sure it's the best hotel in Agra, but unless you have money to burn I would suggest splurging elsewhere. My wife and I stayed at Amarvilas in November 2007. We were drawn in by the documented stunning views of the Taj from most of its guest rooms, restaurants, and lounges (as well as the lack of good lodging options in Agra), but we were unsure of our decision given that it was to be the most expensive hotel reservation we had ever made. After our less than pleasant overnight train journey and early morning transfer at the Mathura train station, I was no longer questioning the decision and was looking for comfort. Upon our arrival, I really did not have any further qualms, as we were given an upgrade to one of the top suites in the hotel. The suite was incredible. The most recent guests in our room may well have been Bollywood's "Big B," Amitabh Bachchan, or Mick Jagger (both were sighted recently at Amarvilas). Bill and Hillary Clinton have stayed here. We had a huge living area with a large balcony overlooking the grounds and a head-on view of the Taj. Off the dining portion of the living area was a kitchen with its own door for room service staff to enter. Our bedroom was lovely, with an ultra-luxurious and comfortable bed. The bathroom complex was something else. It had a huge, round, glass-enclosed, rain-style shower; a claw-foot tub with a window facing the Taj; multiple sink and mirror stations; and more than we can even remember now. We also had a powder room off the living room and another balcony leading from the bathroom. It is needless to say that everything was marble, beautiful fabric, etc. The staff was great; our check-in was painlessly processed in our room, and the service could not have been better. Simply put, it was the best hotel room we have ever had---and we certainly have stayed at the Four Seasons and comparable hotels before---and, certainly, will ever have. It would have easily been a multi-thousand dollar a night room, and that is not even considering the stunning views of the most beautiful building in the world. Looking back, we have no second thoughts about the splurge. Granted, not everyone will receive such an upgrade, but you never know! Dining at the hotel restaurants was excellent as well. We had a nice lunch at Bellevue and a delicious dinner at Esphahan (including a Lucknavi biryani). Ambiance at both was excellent. Our room service breakfast was tasty and beautifully presented, too. Maybe the prettiest hotel i've ever stayed in ! I was alone for a work trip and after staying in some really basic accomodations in New Delhi this was heaven. Had a room without a balcony and it was just fine- with a beautiful view. The pool was fantastic, the massage and facial were fantastic, and best of all the staff was just so nice and unpretentious -- I felt welcomed and comfortable. expensive yes--although being there off season brought the price down --but its worth saving for --worth it for sure. We stayed in this hotel for 2 nights at the beginning of our honeymoon. What can I say! It is just one of the most amazing hotels I have ever stayed in, if not the most amazing! We stayed in the more basic room and it was beautiful! it had a lot of charm, was spotless clean, had a beautiful bathroom and an amazing view of the Taj Mahal. Couldn't have asked for anything more! Staff was amazing all the way through! We tried both restaurants and enjoyed both of them although thought the food at Bellevue Restaurant was just incredible!!! We didn't use the swimming pool so can't comment on this but the grounds are just breathtaking!!! Also, we tried a massage at the spa which was one of the best I had in the whole trip! All in all a great experience, a brilliant start to a trip, would go there again. My husband as well thought it was his favorite hotel of all in this trip, and we stayed in a great selection of India's best hotels. I don't think you could go wrong with this hotel! Linus Ann Arbor, Michigan May 19 2008:“Wickedly expensive, but definitely an experience” To be upfront, I must admit that I'm a business traveler, not a luxury hotel traveler. This was a treat at the end of a business trip to India, stopping by to see the Taj Mahal on my way out of the country. The hotel was lovely, although the staff was incredibly stuffy. I had been sitting in a car for five hours upon arrival, and the staff kept insisting that I sit down while I wait for a personal concierge to check me in. They really honestly wouldn't be happy until I sat, and pestered me about nine times to sit. So I did. Then they walked me up to the room, and went through the check in process there, which I found kind of off-putting. Although maybe this is a luxury chain thing that I don't understand. The view of the Taj Mahal from the hotel room is incredible. It's so darn close. I didn't have a balcony, but it was summer in Agra, so staying inside was fine by me. The temperature at the end of April was something like 108 degrees F/45 degrees C, so it was HOT. The pool is simply the most exquisite pool I have ever been in. The water was perfect, and the staff around the pool were very attentive without being too much. The only complaint I had was that there are not nearly enough umbrellas at the pool. I think there were six total -- which seems somewhat hard to believe in the desert in India. The Internet was expensive -- probably $25 for a day's connection. The staff was very helpful helping me find a new driver back to Delhi, because the one I came with had car problems on the way down. If I were to do the trip again, I'd probably put the Oberoi/Taj Mahal visit at the front of the trip, instead of the end. I don't know if my complaints with the hotel and leg of the trip have to do with anything they did, or if I was just done and ready to go home. 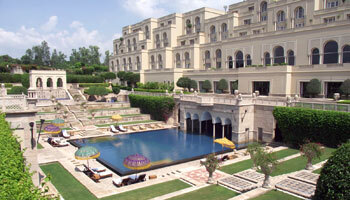 The Amarvilas was the second of five Oberoi Hotels on our recent trip to India. It was a charming hotel, and the views of the Taj just wonderful. The Taj Mahal was the highlight of our trip,(didn't think it would be, but it was) just mindblowing, and to be able to see it from your room is truly wonderful. There cannot be many better views in the world. The hotel was a lovely oasis amongst the chaos of Agra, and we could not fault it. The staff were friendly and efficient. The rooms spacious and comfortable and everything you would expect from the high standards of Mr. Oberoi. The pool and grounds were beautiful, and having the Taj as a background was just magical. It was a lovely touch being taken as far as vehicles are allowed by golf buggy. We loved Agra, and we loved the Amarvilas, and would not hesitate to recommend it.